Peak foliage reaches the Patapsco Valley! Peak Foliage season has reached the Patapsco Valley! This week Patapsco Heritage Greenway staff took the time to get out and explore the Patapsco Valley. We are serious about our mission to preserve, protect, interpret and restore the environment, history and culture of the Patapsco River Valley. In order to be the best stewards and spokespeople for the Patapsco Valley, we think it is important to get out and enjoy the area ourselves! 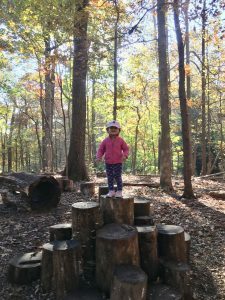 Executive Director Lindsey Baker took her daughter to the Hilton Area of Patapsco Valley State Park. 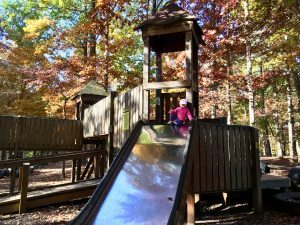 This area is well known to Catonsville residents and often sited as one of the best places to bring kids because of the accessible tire park, sensory trail, and nature center. Adriana is 2 and approved of her new “jugar” which means “play” in Spanish! Program Manager Hannah Zinnert took some time to explore the Hollofield Section of Patapsco Valley State Park. The Hollofied Section is at the center of the park with an entrance off Route 40. Here you will find the Park Headquarters–a great place to grab a map before you set out. 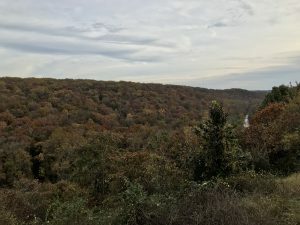 Hannah took some great shots of her hike and the overlook which is spectacular this time of year! Program Coordinator DJ Scheckelhoff took the original Patapsco Pup, Chase, for a walk around Peaceful Pond and the Daniels Access Trail. The Peaceful Pond Trail is a wonderful trail for a short lunchtime walk and reflection, as it is only .1 miles. 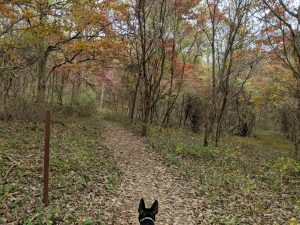 You can extend the walk to the Ole Ranger Trail for a 1.5 mile loop. 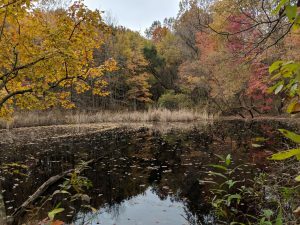 For more information on Peak Foliage, check out the Fall Foliage and Festival Report from the Maryland Department of Natural Resources. The Maryland Department of Tourism also has some other ideas for Fall Foliage Trips on their website.